This joint allows robust rotational motion, with only a bolt, ball bearing & two washers per joint. They are cheap to make and forgiving to build. Its perfect if you require joint which can retain its position at any angle. Typically in this application, you would use a Thrust Bearing, but I've developed a way to use Deep Groove Ball Bearings because 608 Skate Bearings are dirt cheap, <$0.50/bearing, and readily available. This Phone Stand here is just one of possible use for the Constant Force Joint. It's a design element I find myself using regularly so I hope this can serve as a comprehensive look at how they work and how to use them. I've put together an in depth look for you below, enjoy! 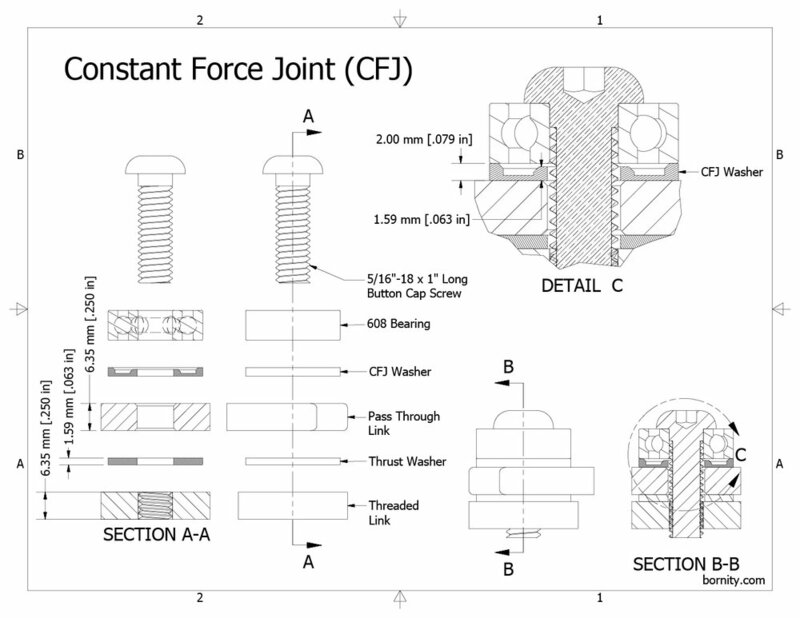 what is a Constant Force Joint? Turn it and it stays in that position. It will maintain whatever pose you choose. This joint is very rigid and only allows motion on a single plane. Backside view of all the Bearings. The stand with 4 Constant Force Joints has nearly unlimited movement. Where ever you adjusts it to, it stays. Bend it over backwards to look at your phone while the stand is on the counter. Do the twist, from portrait to landscape. The Phone Clip removes easily with a quick twist of one of my Ultimate Jig Knobs. A printed T-Slotted profile slides off the T-Bolt. As you'll see below, the clip attaches to the printed T-Slotted profile with a Pass-thru Constant Force Joint. Disassembly of a Standard Constant Force Joint. This is a blind connection. 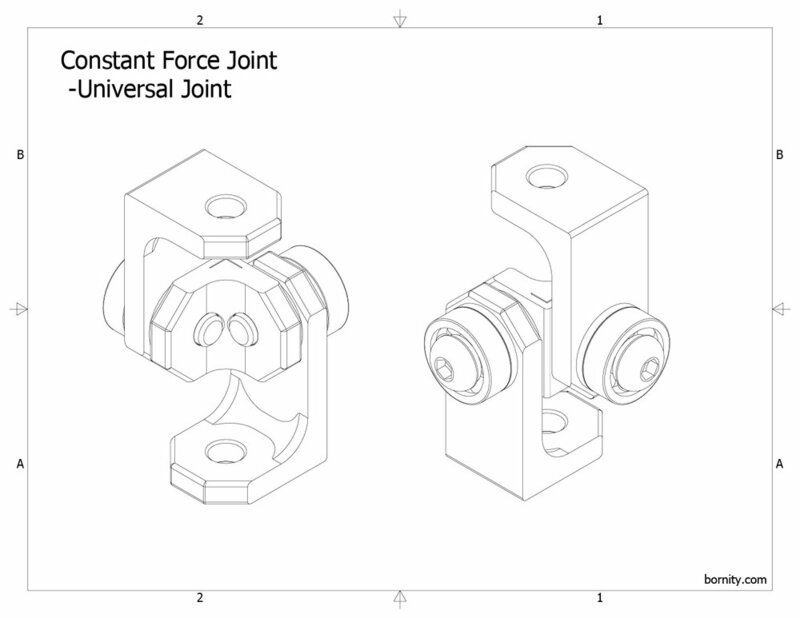 Assembly of a Standard Constant Force Joint. The yellow washer I flash at the camera is the Constant Force Joint Washer. Disassembly of a Pass-thru Constant Force Joint. This version works well for mounting clips and clamps through T-Slotted extrusions and parts. Assembly of a Pass-thru Constant Force Joint. The yellow washer I flash at the camera is the Constant Force Joint Washer. Pass-thru Constant Force Joint parts. This is how I captured the photos and videos you see on this page: with another CFJ mechanism. This one made mostly of of Aluminum. In fact, almost every photo and video on my page was captured while mounted on my Aluminum Phone Stand. CFJ's have an amazing amount of versatility. If you need something to pivot, this may be the easiest way to get smooth rotational motion. They are one of my most used design elements. Solo shot of my aluminum 4 bar linkage phone stand. It's invaluable for getting good photos. And in fact, my Table Saw / Router Table Setup uses 3 CFJ's for a very smooth tilting motion. Bolt, bearing, CFJ Washer, link, thrust washer, threaded link. 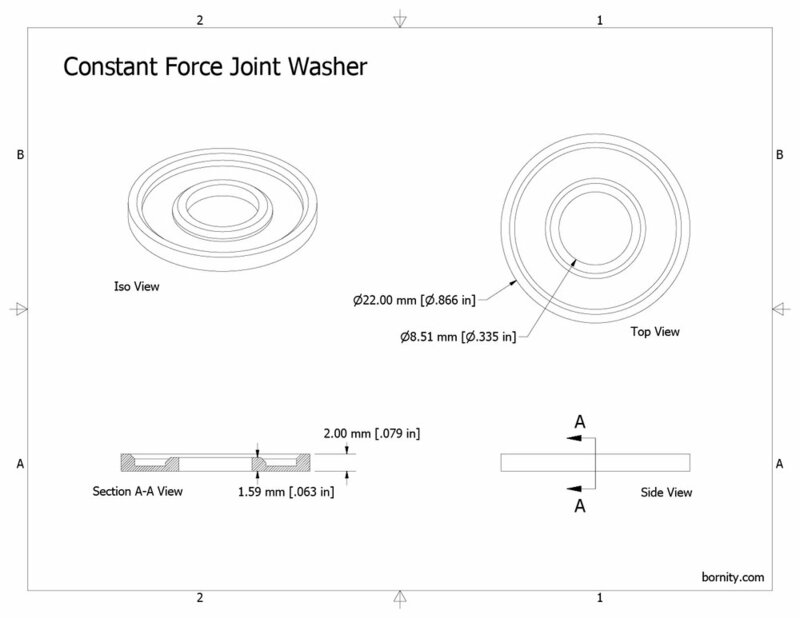 A constant force joint is a pivot joint with 1 degree of rotational freedom that maintains a constant normal force on a thrust washer sandwiched between two links. A bolt is used to axially load a deep groove ball bearing on the inner raceway. That force is transferred to the outer raceway and onto a nifty ridged washer which fixes the outer raceway but leaves the inner free to spin. The bolt + bearing + washer are inserted through the first link, a Thrust Washer and threaded into the second link creating the joint. This setup allows for a blind pivot joint with no need for a rear fastener. The joint relies on the friction between the link-Thrust Washer-link connection. This friction allows the joint to resist a decent amount of force/torque before rotating. By adjusting the thrust washer material you can adjust the friction coefficient and thus the force/torque the joint resists. This nifty washer the part that allows the joint to function. The outer lip is thicker and rests against the outer bearing raceway. The inner lip is thinner to allow the inner bearing raceway to spin unhindered, but still needs to be thicker than the thread pitch to prevent the washer from getting wedged in the threads. You're Axially Loading Deep Groove Ball Bearings?!? Yes, this is an application where typically a Thrust Ball Bearing is used. However, Thrust Ball Bearings are not cheap, are 3 parts, 2 washers + Ball Bearing Cage. Additionally at this size 5/16" or 8mm have horrible load capacities. As in 15lbs Dynamic Load Capacity. Deep groove ball bearings can be axially loaded to 25% of their static load capacity which is ~80lbs for 608's. And when you overload them, the joint won't spin, so you know to back the bolt out. Typically a universal joint transfers motion in offset shafts. But with 2 CF Joints, you can make a half universal joint which has 360 degrees of freedom, and able to hold any position. 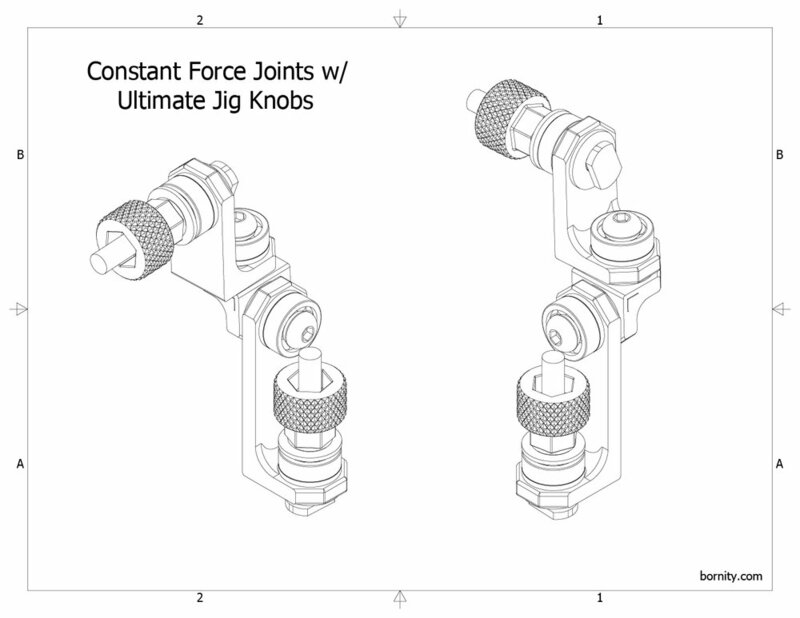 CF Joints can be combined with a T-Bolt and knob, like one of my Ultimate Jig Knobs, to give you a repositionable joint. The T-Bolt, CF Joint and Knob function both as the lock down and pivot joint. They can slide in and out of T-Slotted Extrusions without tools. Nala and Starsky asleep in a box!